Thanks for your interest in Barrett Family Dental. Part of our mission here is to provide the best patient experience possible. Please take a minute to check out what others have to say to us. And if you're one of our current patients, we'd love to know what kind of experience you had here! I am a super dental chicken, I had to get dentures. Doctor B made it completely possible for me to get treated. GREAT STAFF...THEY were able to get the job done for me...I hate to even say it...it was a little fun as well, HIGHLY recommend this glorious doctor and staff COOBA!!!! to them!!!! I was so impressed with Barrett Family Dental. I needed an emergency appointment- I called them and had an appointment a few hours later. I had barely finished new patient paperwork when I was called back and received immediate attention. Not once did I sit and wait. The staff was helpful and concerned about my emotional and physical comfort from the moment I walked in their doors. I felt confident in the care provided and the recommendations offered. There was no pressure for extra services, absolutely no scare tactics or shaming that I have experienced in the past. I am actually looking forward to to getting my dental health back on track. I highly recommend this dental practice! Dr Barrett is the kindest most caring dentist you will ever meet. He has gone above and beyond to help me. I've had several emergencies over the past few years and he comes into the office to help me every time. He came into the office today-Sunday Dec 23rd because my tooth chipped in the front. They are closed through the holidays and it is Sunday! He repaired my tooth quick and painlessly. I cant recommend Barrett Family Dental enough. You will be in great hands with perfect care. Thank you so much Dr Barrett! Dr. Barrett has given me hope again that I will one day soon have my smile and confidence back. I have had some awful experiences with previous dentists and them degrading me and what I had left of a self esteem, due to the condition of my mouth. Each time i would leave in tears terrified to go back ever again. Then I met Dr. Barrett. I first went to him about 3 or 4 years ago and immediately felt at peace. He is kind, patient, understanding but yet direct and to the point. He will do everything in his power to help you anyway he can. I still have a long road ahead of me but I know I will eventually get my self confidence back and I will have Dr. Barrett and his team to thank. He's truly been a blessing to me and my 3 kids. I purposely chose a specific insurance when my coverage changed in order to be able to stay with him. Him, his office, and his team are all absolutely amazing. You will not be disappointed. Kind, gentle, and genuine concern for your comfort. Dr. Barrett and his team made a painful situation and procedure much easier for me. Thank you. I've been a patient of Dr. Barrett and his amazing hygienist for a few years now and it's been the best experience I've ever had with a dentist office! I am VERY sensitive when it comes to getting dental work done, but Dr. Barrett Won't stop until everything is just right! They are skilled, gentle and thorough. I wouldn't trust anyone else with my teeth! Dr. Barrett and is staff are amazing! Very caring and efficient. Knowledgeable and they communicate well with you as a patient and with each other! It’s a great feel in that office and I’m happy to have chosen them for my dentistry! Always open for questions, tips and tricks, and concerns! I have had nothing but the best professional and courteous service at Barrett Family Dental. Dr. Barrett is gentle and thorough in his work, always placing his patients well-being and experience above all. You can tell the staff are well trained and organized. I have never had to wait long for my appointments and always leave feeling great or as good as possible for just having cavities filled. With candor I recommend this business to anyone looking for great dentistry service. I recently had a deep cleaning here and usually they break up the appt into 2 days, but because of my busy schedule, they worked with me and got the work done in 1 day. Actually, we were done in just over an hour. Mariah did the work and she was amazing! Im pretty sure she has mastered her craft. the office is perfect the hygienist was great. my check up was perfect. i highly recommend barrett family dental! Came in for an initial visit. Cleaning was performed by Miriah, who was not only pleasant but did a thorough cleaning of my teeth. I have a few exposed roots which can be quite painful during cleaning but she avoided them all. Dr. Barrett too was very pleasant and professional. I will be returning and recommend this office to others. 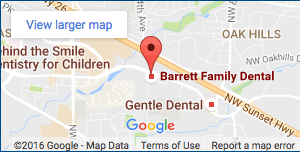 BARRETT FAMILY DENTAL : Is an amazing estabment , the staff is very kind and extremely well knowledgeable. Setting appointments for my family and I was a breeze and considering we live so far they we're able to get all our appointments in the same day (4 of us) . Worried about your insurance? Dont. They were great in helping us out with that . We have had bad experiences with other dental locations (i will not name) but the experience here is one that we will look forward to for a long time. I have had a great experience with Barrett Family Dental! They did a great job on my teeth. I typically don't like visiting the dentist but they made it very comfortable and quick each time I came. I highly recommend them!!! Friendly staff, pain free, super quick. I fell and chipped my tooth and they got me in the same day and took care of me. Thank you! Our family will return for future dental needs. I first visited Barrett Family Dental more than a year ago. Before my visit, it had been well over a decade since the last time I had seen a dentist. Needless to say, I was apprehensive about what type of experience I would have. The staff couldn't have been more kind and reassuring. After my exam, there were a few minor issues to address. Dr. Barrett took care of these issues and even followed up with me about a week later to make sure there were no lingering issues. Thanks Dr. Barrett and Staff! Dr. Barrett and his team are amazing! Like most other people in the world, the dentist is not my favorite place to go but I honestly look forward to coming here. They are all very kind and thorough and great at explaining what they are doing and why it needs to be done. They really care about you here and I feel very comfortable in their care. Barrett Family Dental is an amazing dental office! They provide the best clinical and personal care. The entire staff is so professional and kind. I am very impressed with everyone on the team, and always appreciate the warm welcome from the front office staff. Thank you all for being to terrific! I recommend everyone to this office. Do you want to go to a small, non-corporate dentist office where they actually know you and care about you? Then, this is the dentist office for you. The staff goes out of their way to ensure comfort and calm. There is no shaming here either! The work has been outstanding so far,. I appreciate that Dr. Barrett is conservative in his approach with my best interest in mind. Seriously, this is the best dentist office I have been to EVER, so I will now be a patient for life. Dr Barrett does great work and the whole staff is amazing. Had a bunch of work done there in the past few months (fillings, crowns, cleaning) and am more than pleased, can't wait to see them again. This is a wonderful dental office, they are attentive and skilled. Dr. Barrett, Lisa and Julie have taken the time to get to know me and don't treat me like I'm just a number. The last dentist I went to would charge me for every little adjustment and left my fillings so high that I was totally uncomfortable chewing, for years! Dr. Barrett patiently took the time to repair my bite and my old fillings before moving forward with my care plan. For the first time in years I can chew on both sides of my mouth, and I'm comfortable eating crunchy food again! I also love my hygienist Lisa, she makes me laugh and keeps me entertained during my cleanings, plus my gums are in better shape than ever. And much thanks to Julie for working around my crazy schedule to set up convenient appts! As it had been almost a decade since I'd been to the dentist i have a handful of cavities that needed to be filled, two of which were flirting with root canal territory. I walked out this afternoon the proud owner of a new crown... all done with no nervous breakdown. Dr. B is fantastic at soothing nerves as well as all things dentistry. I will be going back for anything dental that I need for the rest of forever. I cannot recommend him highly enough.